“I think it’s Leo’s greatest creation." 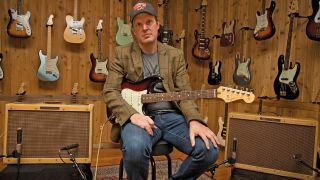 Joe Bonamassa discusses Fender's '59 Twin-Amp with GW. “Different Shades of Blue” will feature classic and modern blues songs, as well as new music from emerging artists. The annual event will take place in Asheville, North Carolina, over two nights in December. The festival, which also features Peter Frampton, sets sail in August 2019, from Barcelona. Becker's new album, 'Triumphant Hearts,' is out December 7. Joe Bonamassa Shares Video for New Song, "I've Got Some Mind Over What Matters"
The guitarist's new album, 'Redemption,' is out September 21. Joe Bonamassa Shares Video for New Song, "Just 'Cos You Can Don't Mean You Should"
Joe Bonamassa Shares Video for New Song, "Self-Inflicted Wounds"
Watch Joe Bonamassa Cover Jeff Beck's "Let Me Love You Baby"